Anyone who handles a horse must learn to tie a lead rope securely. Slip knots, otherwise known as quick-release knots, allow you to reliably keep your horse tied in place while still being able to easily undo the knot when you're ready to release her. Unlike many other knots, slip knots won't tighten to the point of becoming difficult to untie when your horse pulls away from her post. Remember, tie your lead rope to a sturdy post -- and not the rail -- that your horse can't pull down or out of the ground. Affix the snap end of the lead rope to your horse's harness. Thread the free end of the lead rope through the tie ring if one is available. If one is not available, wrap the rope around the post from right to left. Leave about 3 feet of rope between your horse and the post to prevent crowding your horse or giving her too much slack in which she can become tangled. Take the tail end of rope in both hands, with your hands positioned about 1 foot apart. Cross it under the first section of rope running from the harness to the post, with one hand on each side of the first section of rope, making a figure 4. Twist your left hand to create a loop at the point of the left point of the figure 4. The loop should be about the size of your fist. Bring the tail end of the rope in your right hand over the first section of rope. Insert the bottom of the U-shape you're holding through the loop in your left hand. Pull the U that's protruding through the loop until the slip knot tightens. Don't allow the tail of the lead rope to come through the loop while tightening. Slide the knot so it's up against the post. 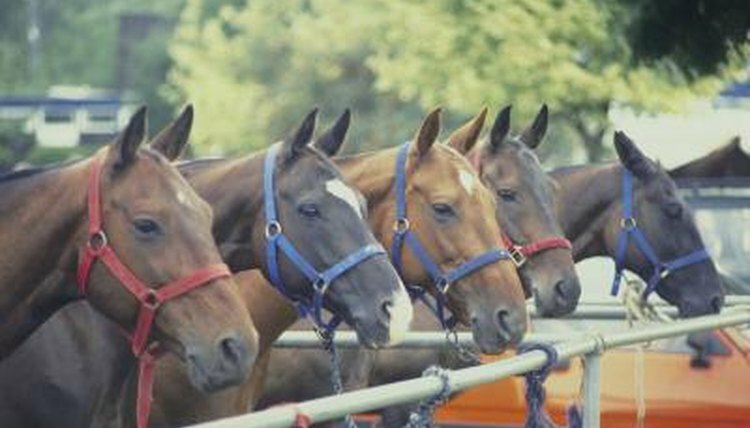  When you tie your horse, leave enough space between her and other horses to prevent biting and kicking if any of the animals become agitated or afraid.  Untie the slip knot simply by pulling on the free end.